15 km from Manosque - 63 km from Marseille airport - "Gite rural" 3 stars. When driving from Aix-en- Provence or Sisteron on the A51 motorway, take the Manosque exit. Continue towards Manosque, then go in the Apt, Pierrevert direction. 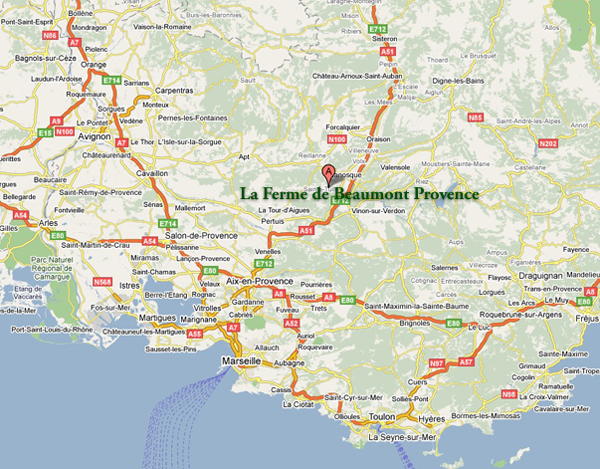 Follow the D6 road, do not enter Pierrevert town nor the Golf du Luberon, but drive towards Bastide-des-Jourdans. After 7km, you will notice on your left a signpost. Make a left turn towards “Le Clapier” and “La Ferme de Beaumont”. 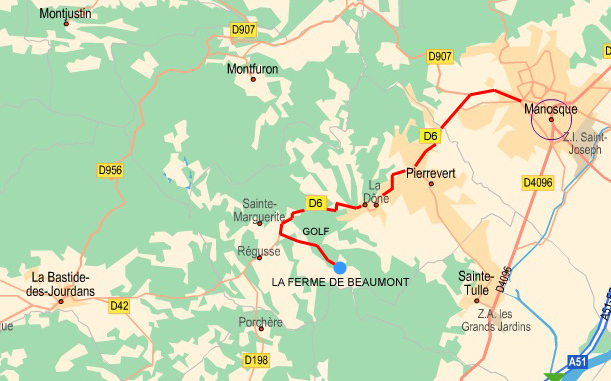 Drive for 2.5 km to the gate of the “Ferme de Beaumont”.